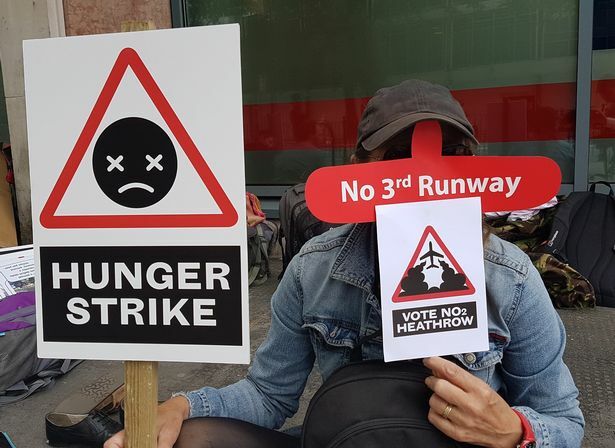 On Saturday 9th, campaigners from the Vote NO Heathrow campaign started a hunger strike, to draw attention to the huge risk that MPs might vote in favour of a 3rd Heathrow runway. The vote is likely in the next two weeks. Over 30 campaigners gathered outside the London HQ of the Labour Party in Victoria Street, for the start of the hunger strike by 5 of them. They intend to continue not to eat for as long as their health permits, and if possible until the vote in Parliament. 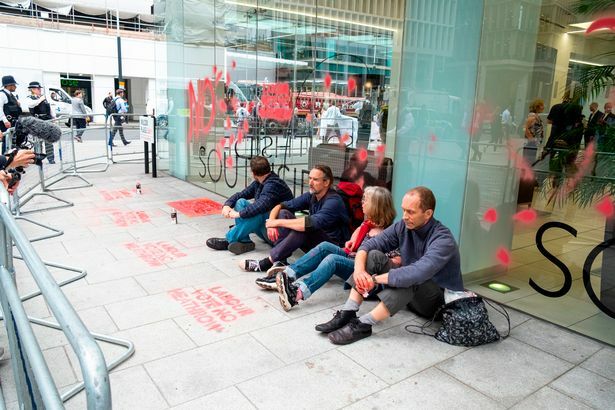 Earlier in the week, 8 campaigners were arrested outside the building for using chalk spray on the pavement and the glass windows, to highlight their message. The vote of the Labour party is crucial, and it is hoped that MPs will appreciate that the runway fails the 4 tests Labour has set for it, and impose a 3-line whip. The Tories may impose a 3-line whip in favour of the runway. The Vote NO Heathrow campaign wants as many people as possible to write to their MP – of whichever party – to ask them to vote against the runway. There are many important arguments, why the runway should be opposed (more details below) but these could be summarised as economic problems, UK region problems, noise, air pollution and increased carbon emissions. A three-line whip is the strongest indication a party can give to its MPs on how to vote in Parliament. If a Labour MP “defies” the three-line whip there can be consequences such as being removed from posts. The Conservative government is expected to impose a three-line whip in favour of the airport’s expansion, which may cause problems for Foreign Secretary Boris Johnson . The Heathrow expansion will be a disaster. It has failed all of Labour’s impacts tests on climate change and air and noise pollution. The party must uphold its values of ‘social and economic equality’ by firmly voting against the expansion. More than 30 campaigners will be outside the Labour HQ on Saturday and we would love you to join us in our fast, either in person or in solidarity. The Vote No Heathrow campaign are calling on everyone to write and speak to their local MP and urge them to vote against the expansion. Even with strong signals from party leaders, many MPs are considering rebelling on the issue based on their constituents views. We must make sure your voice in his heard in this debate. There is some information at the bottom of this webpage, with reasons why MPs should vote against the runway, to help people with their letter or email to their MP. A group of anti- Heathrow expansion protesters, from the Vote NO Heathrow campaign, staged a hunger strike outside the offices of the Labour Party . At least 5 of the protesters hope to continue their hunger strike and civil disobedience protest indefinitely, until the Labour party impose a three-line whip against expansion. Some of the hunger strikers were wearing T-shirts reading “Love Labour: Hate Heathrow”, and placards reading “Vote No Heathrow” and “Hunger Strike”. 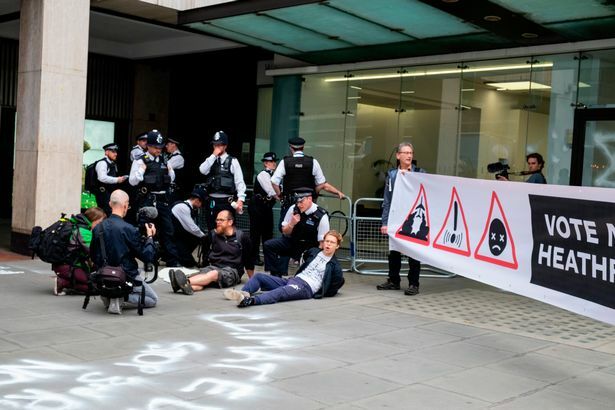 The “civil disobedience” has come after the government’s long-awaited National Policy Statement on Airports was published on Tuesday (June 5), and the cabinet voted to go ahead with the construction of a third runway , north-west of Heathrow’s current airfield. The protesters also sat outside the Unite union buildings; TUC, Community and BALPA have all expressed support for the 3rd runway, hoping there will be jobs. A three-line whip is the strongest indication a party can give to its MPs on how to vote in Parliament. If a Labour MP “defies” the three-line whip there can be consequences such as being removed from posts. The Conservative government is expected to impose a three-line whip in favour of the airport’s expansion, which may cause problems for Foreign Secretary Boris Johnson . The Uxbridge and South Ruislip MP famously promised to “lie down with you in front of those bulldozers and stop the building, stop the construction of that third runway”, speaking to protesters. “Those who stand to gain from the new runway are limited to a wealthy minority of frequent flyers; the rest will suffer a devastated climate, bulldozed local homes and even more toxic air. All progressive MPs must oppose expansion of Heathrow. “We are calling on MPs and influential unions like Unite to look at the bigger picture: climate breakdown is being driven by wealthy people, who fly, and the impacts are hitting poorer people first and worst, who do not fly. Test 1: Robust and convincing evidence is provided that the required increased aviation capacity will be delivered. Test 2. The recommended expansion in capacity can go hand-in-hand with efforts to reduce CO2 emissions from aviation and allow us to meet our legal climate change obligations. [In reality the NPS has no solutions to cutting aviation carbon emissions – it gets the barest mentions only]. Test 3. Local noise and environmental impacts have been adequately considered and will be managed and minimised. [They have not been – air pollution and noise cannot realistically be reduced with a 50% larger airport, located in a very crowded part of the south east, with flight paths inevitably over-flying densely populated areas, for miles and miles]. Test 4. Benefits of expansion will be felt in every corner of the country, not just the South East of England, and that regional airports will be supported too. [There is good reason to expect regional airports will be harmed by the expansion, with lucrative long haul routes largely being from Heathrow. Domestic flight links to Heathrow would only be maintained if the airlines flying them are subsidised, as these routes are loss-making]. According to government documents revealed only after a Freedom of Information request, the increased noise from the additional aircraft and traffic are expected to affect up to 2.2 million people. Airport noise is already a problem over larger areas than just West London – some areas are overflown by both Heathrow and London City planes. However MPs will not be given information about flight paths – these are being decided later in a completely different process. Aircraft noise is not ‘just’ irritation – it can impact mental health, and increase risk of increased blood pressure, and higher risk of heart attack, heart disease and stroke. Health is also detrimentally affected through sleep disturbance. Aircraft noise impedes the memory and learning ability of school children. It will exacerbate the gap between the South East and poorer regions. The Airports Commission’s own modelling suggests that traffic at regional airports would fall on average if a new runway was built at Heathrow. Suppose Heathrow could be expanded with no extra car journeys… how much would the infrastructure for that cost? Even Heathrow accept it will cost £5bn, but TfL have estimated an extra £10-15bn on top of that for transport links. Ironically, as Heathrow plans were laid before Parliament, newspapers across the North of England united in anger over recent rail chaos – and more systematic neglect of public transport outside London and the South East. This is where public funding should go to help our economy. What if something goes wrong financially? Heathrow Airport Ltd already has significant debt and is borrowing even more to build a third runway. It’s “overbid” with it’s third runway proposal. Someone has to pay for that. With the government stepping in to bail out nuclear power stations, would taxpayers have to do the same with a ‘too big to fail’ third runway. MPs can’t rely on the ‘official’ figures in support of Heathrow expansion being accurate. One example (that this reassessment did not consider, but which came up in the Transport Select Committee’s recent report) – the carbon emissions from additional air travel from a third runway (costed at £18.5 billion) have been excluded from cost benefit analysis. The relatively small figure of £624 million relating to airport operations and passenger access was used instead – taking 96% of emissions off the balance sheet. Airport capacity – is another runway really needed in the South East? This has been the great unmentionable in the ‘Heathrow/Gatwick’ debate – the idea that additional runway capacity may not be needed in the south east of England. AEF’s report from 2016 points out that the London airports system is larger than that of any city in the world, with Luton and Stansted half empty. They state, ‘If there was demand for ten times as many daily flights to China, airports in the South East could handle that tomorrow, without any additional runway capacity.’ Numbers of business flights have in fact been falling. Carbon trading/offsetting is not a solution: It has a poor record for actually delivering promised emissions reductions elsewhere. And as the chair of the Committee on Climate Change, Lord Deben, has pointed out, emissions cuts will increasingly be used to deliver countries’ own demanding commitments under the Paris climate agreement – where will these additional cuts come from? The obvious answer is double-counting – ‘fake’ emissions reductions. On the same day the Heathrow runway was approved by Cabinet, six European countries threatened to walk away from the international carbon offsetting scheme for aircraft emissions – because it was being weakened to the point it was just a greenwashing exercise. Biofuels are not the solution: The idea that sustainable biofuels would be available in sufficient quantity is very doubtful. For example, a report by Biofuelwatch argues that the only biofuel which currently appears feasible for use at scale is palm oil – and the expansion of palm oil cultivation would be far from good news for the climate. Other technical fixes are not the solution: In the most recent figures produced by the Department for Transport, the expected future carbon emissions from aviation have been reduced, compared to those produced four years previously. There is no real explanation for this increased optimism – or what to do if it appears unfounded. Fact. Aviation emissions can be around twice as damaging as CO2 from other sources: Aviation’s climate change impact is around double what it would appear from measuring CO2 alone (from other gases emitted at altitude and the formation of contrails). To have any chance at all of offsetting its impact would therefore require doubling the CO2 removed from the atmosphere elsewhere. This is being quietly ignored by the international aviation industry and by the UK government. Myth: the Airports Commission found that Heathrow expansion was compatible with our climate targets: In fact all the committee claimed was that this was theoretically possible – IF additional policies were implemented such as an extremely high carbon price (which the government has no intention of implementing). Thereby giving a fig leaf which has no basis in fact. Posted: Sunday, June 10th, 2018. Filed in Climate Change News, News about Airports, Publicity & Politics, Recent News.